Not once but thrice have the government’s managers been caught trying to fiddle with the bill in order to address the concerns of nuclear suppliers that are obviously so illegitimate nobody seems to have the political stomach to even try to convince the public about them. What were they thinking? That people would laugh and say, what’s wrong with a bit of ‘and’ here and a bit of ‘intent’ there and pat them on the back for their craftiness? 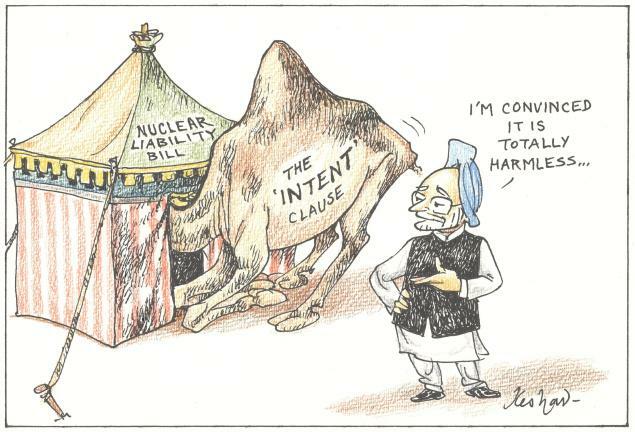 At the initial stages of consideration, the first attempt was made to simply delete Clause 17(b), which allows the Indian nuclear operator — who is otherwise wholly liable — to exercise a right of recourse in the event that an accident is caused by gross negligence on the part of the supplier. Difficult though it may be to prove gross negligence, U.S. nuclear industry representatives made it clear this provision was unacceptable to them. Therefore, without any attempt to discuss or debate the issue publicly, the Manmohan Singh government simply sought to oblige them. On June 8, the Department of Atomic Energy circulated a ‘consolidated list of proposed amendments’ to the Standing Committee on Science and technology suggesting the deletion of 17(b) altogether. When members of the Standing Committee objected, the DAE Secretary, Srikumar Banerjee, said this was only a “suggestion” and withdrew it. Subsequently, when the Standing Committee agreed to strengthen 17(b) by allowing a right of recourse against the supplier in the event of an accident caused by defective equipment, the government sought to nullify it by making this conditional on the same being spelt out in a commercial contract. Forced to abandon that position too, the Union Cabinet finally cleared a version which allows a right of recourse against the supplier only if the latter intentionally causes an accident. That’s a camel so huge it is unlikely to ever pass through the eye of a needle. Somewhere along the line, our rulers forgot that we are a democracy. They also forgot that this is, after all, Bhopal country. Twenty years on, the victims of the world’s worst industrial disaster languish without adequate financial compensation or health care. The Indian administrative and judicial system has failed to assign legal culpability for the incident and still cannot decide who should pay for the removal of toxic wastes from the plant site that have leeched into the soil and groundwater. Against this backdrop, the government ought to have gone out of its way to reassure the public that the lessons from Bhopal were being acted upon, that every concern about the consequences of a nuclear accident would be addressed openly and transparently, that every effort would be made to use the levers of regulation and liability to ensure the highest attention to safety by all those in the nuclear energy production chain whose activities or products could conceivably contribute to an accident. A broad range of views within and outside government ought to have been solicited at the drafting stage itself so that the final product could have the widest possible ownership. But this never happened. Work on the legislation began as an in-house effort of the Department of Atomic Energy a decade ago, well before there was any possibility of the Nuclear Suppliers Group agreeing to nuclear commerce with India. Even though a draft law was readied, the Centre showed little or no urgency in discussing, let alone enacting, it. So much for the official claim that the law’s aim is to provide speedy compensation to victims. Once the NSG clearance came, however, the Manmohan Singh government saw the liability issue as something that had to be pushed through to provide comfort to foreign suppliers. After all, the U.S. nuclear lobby managed to make India’s accession to the IAEA’s Convention on Supplementary Compensation for Nuclear Damage (CSC) — which effectively indemnifies suppliers from any liability — a pre-requisite for any nuclear sales. India gave a formal assurance on the CSC to the U.S. on September 10, 2008 and that is when the legislative clock started ticking in earnest. The DAE’s draft was circulated to only a handful of Ministries — Finance, Environment, Home, External Affairs and Law. Ministries like Health, Water Resources, Food and Agriculture, upon whom the burden of handling a nuclear accident would inevitably fall, were never consulted at the drafting stage. The Standing Committee attempted to remedy the situation at the eleventh hour by inviting other Ministries but hardly any of their excellent suggestions even made it to the committee’s recommendations. As matters stand, a political consensus has emerged over the Standing Committee’s proposal to hike compensation limits and the need to hold suppliers indirectly liable via the right of recourse for defective equipment. Just as in other hazardous industries, of course, culpability will still have to be established in a court of law. But what the suppliers want is a free pass at the start-up stage itself. Instead of relying on stealth, the government ought to argue up front why it does not believe suppliers should be indirectly liable for any potential nuclear accident. But its arguments should be grounded in facts and sound analysis, not theology. For example, if suppliers are forced to take out insurance to cover themselves as a result of the Indian law, how much will this affect the cost of a nuclear power project? It is meaningless to argue that no country, not even South Korea, has a law as balanced in its apportioning of liability as India. India is not “any other country.” It plans to buy 20 to 25 large reactors over the next two decades and need not behave as if it is entering a suppliers’ market. It is said Indian suppliers will also be reluctant to provide components for our indigenous reactors if the operator can exercise a right of recourse against them. But the fact is that the current legal regime in India exposes suppliers to unlimited liability and that hasn’t prevented major Indian corporates from manufacturing products for the NPCIL’s reactors around the country. This entry was posted on August 25, 2010 by Siddharth Varadarajan in Nuclear Issues.